Location: Kamchia resort complex islocated just 20 km south of Varna. The resort is just 2 km from the mouth of Kamchia river and the Nature reserve "Longoza. 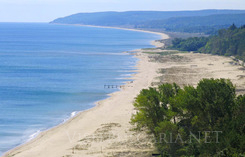 Golden sands is just 35 km north of the resort and Sunny Beach is 80 km south of Kamchia. The resort is huddled in a breech, fir and oak trea forest and is in close proximity to the beach.